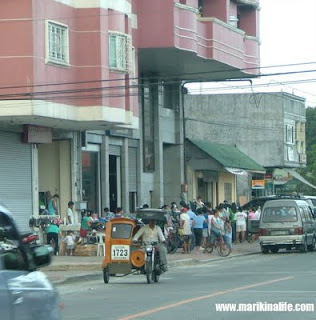 According to Wikipedia taken from a 2007 Census source, Marikina City is the 20th largest city in the Philippines. Its neighboring cities, Quezon City, Antipolo City and Pasig City are the 1st, 7th and 8th largest cities respectively. Marikina City has an average population of 424,000. 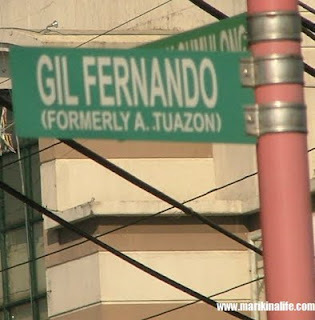 Formerly known as Angel Tuazon St, Gil Fernando Avenue's complete name is Mayor Gil Fernando Avenue. This is one of the main thoroghfares of Marikina City. The avenue connects starts at Marcos Highway leading in to the heart of Marikina City. One will find several establishments cruising along this avenue. There are several banks, restaurants, gas stations and automotive shops. In the evening, the avenue transforms into a series of bars and restaurants geared up for nightlife. Its next main intersection is Sumulong Highway where you will find Bluewave Marquinton Mall and Robinsons Supermarket. Turnong right from Sumulong Highway will lead to Vista Valley subdivision, Marikina Valley Medical Center and the Katipunan Sumulong extension which is a shortcut leading to SSS Village, Marikina Heights and Parang. Turning left from Sumulong Highway leads to Bayan where City Hall, Marikina Sports Center, E Rodriguez Hospital, Marikina Riverpark and the City Market are within close range. Moving forward will lead to City Engineering Offices, Car Impound, Dog Pound, and streets heading towards Paliparan, Concepcion and several neighboorhoods such as Strip 70, Goodrich Village and Oro Vista Subdivision. This main road is also the route of public transportation such as the Marikina Bus Line heading to San Mateo and the Cubao-Montalban jeeps and Tamaraw FXs headed to Montalban. Recently, the Fairview-Cainta jeep route also passes through Gil Fernando heading to the Batasan Road in San Mateo. 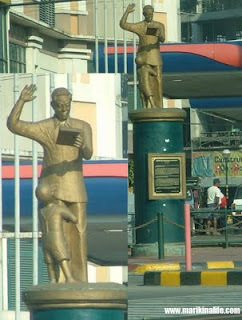 The story behind the Avenue's name is that Gil Fernando was a former mayor of Marikina City. In addition, he is also the father of former Marikina City Mayor Bayani Fernando. Gil Fernando Avenue, one main artery of Marikina City. 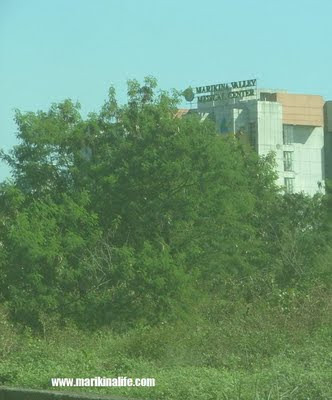 the 6 story hospital at a distance from Gil Fernando Ave.
Cynergy Inc. has been one of the long running printers in Marikina. Most of Bayani Fernando's tarpaulins are being printed here. They are just right beside Pan de Manila bakery, Shell Gas Station and Veterans bank along Gil Fernando St.
A newly opened printer has just set up shop in the new building directly facing Cynergy. Their name is JPEC. And their services include indoor/outdoor tarpaulin, billboards, banners, panaflex and sticker printing. They have parking available in front. Their address is 67 Gil Fernando St., Barangay San Roque. Since they're just across Cynergy, it makes your canbassing needs easier. Check them out. After the series of condos behind Bluewave Marquinton is a new set of buildings to arise called the Marquinton Garden Residences. 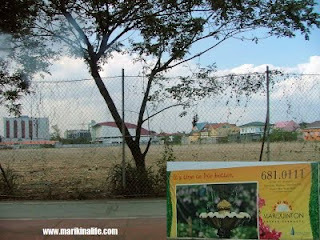 This site will rise just beside the Marikina Valley Medical Center along Sumulong Highway. The gate has already been build and the ground has been flattened in preparations for the future multi-storey multi-building neighborhood. Bluewave Marquinton mall was one of the directly affected buildings along Sumulong Highway during the Typhoon Ondoy floods. The mall was closed for a month afterwards to undergo repair. Soon after it reopened, the stores located on the ground floor one by one re-opened. A couple of stores though didn't reopen anymore like Mongkok, beside Watsons. One of the high anticipated stores to reopen is Starbucks. There are only 2 starbucks branches in Marikina City and the one in Bluewave Marquinton in particular has been a popular place to hang out and have late night coffee until midnight. Sadly though, there are no signs that the Bluewave branch is being renovated or cleaned up. It pretty much looks abandoned. Hopefully, they will reopen as its location is ideal for Marikenos who crave for their coffee products. UPDATE: Last week, I learned that the owners of this Starbucks branch visited Bluewave Mall, probably for damage assessment or rebuilding plans. 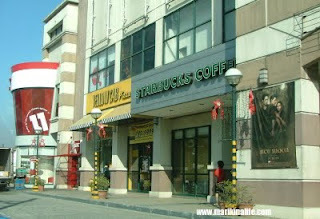 I heard that there are plans for this Starbucks branch to reopened soon. A lot of Marikenos are anxiously awaiting it. One of the most popular and in-demand electrical shop for automobiles is Rey Electrical shop. This is sister shop to its main shop along 15th Avenue in Cubao. This branch is located along Gil Fernando Ave. corner Dragon St. and just across BDO bank and Biksa Coffee. They have a large knowledgable and very skilled crew base who specialize in electrical repairs for all types of cars. They also carry a wide array of spare parts so having your vehicle get repaired here becomes a one-stop-shop. 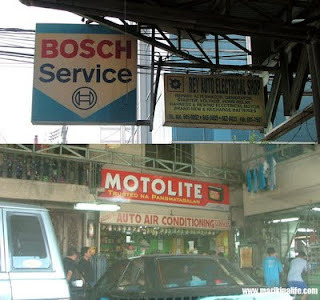 Becuase of this, even non-residents of Marikina come to Rey's shop to have their cars serviced. I personally have my car serviced here as well. If your car may take some time to be repaired, they have a convenient waiting lounge with cable TV. In addition, just right beside Rey is Biksa Coffee where you can work while you wait. (They provide wifi). For your car electrical needs, visit Rey Electrical Shop. 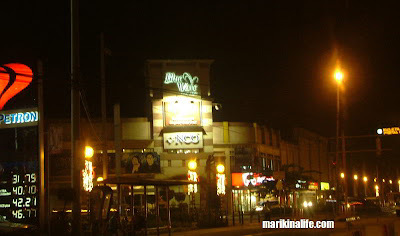 Globe Telecom used to be located at the 2nd floor of Bluewave Marquinton mall. They accepted bills payment, inquiries, SIM and broadband sales, phone applications and all around customer services. 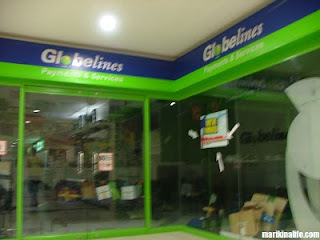 Recently this Globelines branch has transferred to the ground floor of SM City Marikina. You can visit them at their new location. Yearly, Probest, the huge pink building along Katipunan Street in Brgy Concepcion Dos, uses its front parking lot to place their items up for sale. They sell shoes, slippers and shirts at factory prices. They open in the late afternoon til evenings. Several people within the neighborhood usually just walk to the store. Car owners also stop to drop by since it's along the main road connecting Sumulong Highway and SSS Village/Marikina Heights. If you have some last minute Christmas shopping to do, you can check them out. They're located across the corner of Tangerine St. and Katipunan St. along the side of Immaculate Concepcion Hospital. 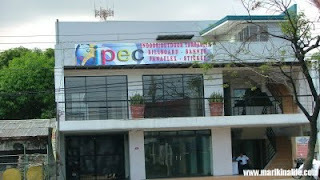 After December 13, 2009 regular Holiday Sunday Mass at Bluewave Strip Mall will resume on July 3, 2010. 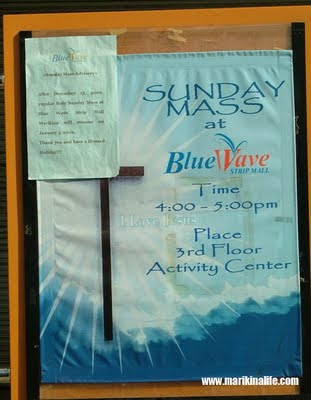 Sunday mass at Bluewave is held every Sundays from 4:00pm to 5:00pm at the 3rd Floor Activity Center. Last December 14, a part of the GMA 7 morning show, Unang Hirit was seen broadcasting live at the park in front of City Hall. A stunning Regine Tolentino was featuring a segment on the Pamilihang Bayan of Marikina. Several stalls at the park were being shown to televiewers as Regine interviewed stall owners about the items they had for sale. If you're not sure what zipcode you're sending mail to in Marikina City, you can use 1800 which is the Central zipcode for Marikina CPO (Central Post Office) and Sta. Elena /Sto. Nino. However, if you wish to be more specific and accurate, here are the codes for each area in Marikina City. 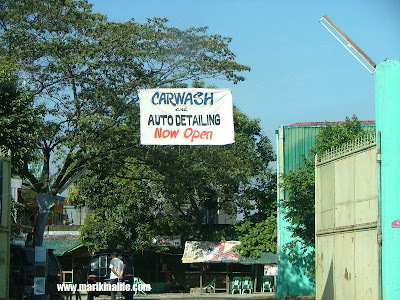 Marikina Badminton Center just opened up a car wash and auto detailing service inside their parking lot. Have your car washed, shined or detailed while you play badminton or have a snack at their snack bar inside. 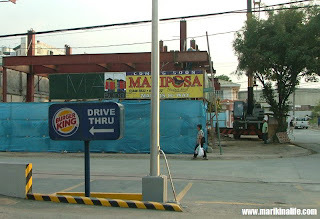 The carwash is located within the Marikina Badminton Center along Katipunan St. in Brgy. Concepcion Dos. There is an ongoing bodega sale at Verbano Travel and Tours office. 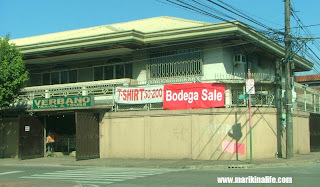 The bodega sale is located at the corner of Falcon St. and Flamingo St. in San Roque and near the Marikina Catholic High School and car wash. On sale are various t-shirts ranging from P50. to P200. and a wide range of slippers and shoes. They are open as early as 9am.